Hans- XSactly a year ago I posted some pics of XS 650’s at the Mooneyes Customshow 2008. In this new update, I would like to show you some pics of The 18th annual Yokohama Hot Rod Customshow held Sunday December 6, 2009 in Yokohama, Japan. Probably one of the best custom shows in the world. 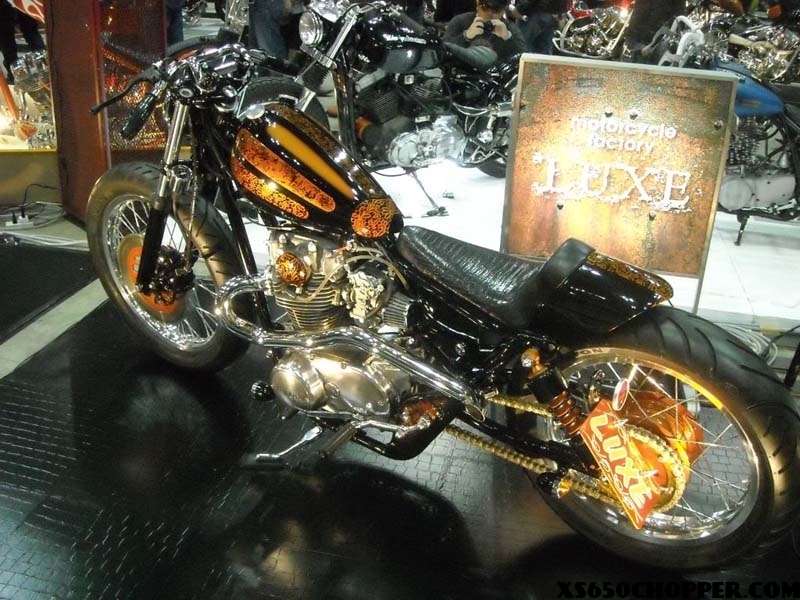 More than 600 motorcycles and 250 hot rods where seen at this show. The invited participation’s came from all over the world, the US was represented for instance by Roland Sands and Cole Foster. On one side the American influence in Japan is incredible, on the other side the Japanese custom world created their own styles. They really do what they want, are fantastic craftsman and have a perfect eye for details. They show it’s not about the money you spend on a bike, but about spirit and ingenuity what make it cool or not. The Bratstyle is, maybe, the best example here. 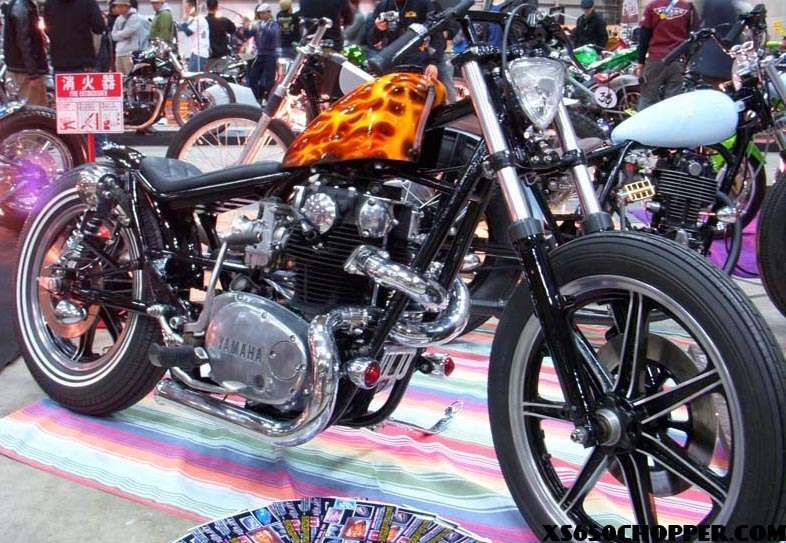 Go Takamine, the ‘inventor’ of the Bratstyle won the first price a few years ago with his famous XS 650 at the Mooneyes show. That year he had to compete with creations like Billy Lane and Johnny Chop, but Go won with his ‘less is more’ philosophy. Bratstyle has its own place in the custom world and is part of the NWOJCB, the New Wave Of Japanese Custom Builders. Sometimes called the Samurai style. Guys like Chica (www.chicacustom.com ) and Zero (www.zero-eng.com) are good examples. 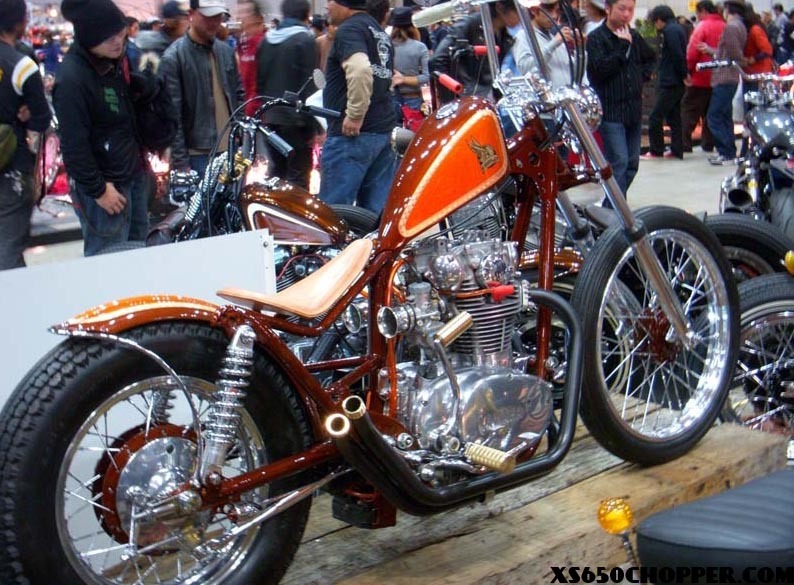 Anyway, at the 18th Mooneyes Show their were of course some fine XS 650 to be seen. A large number outstanding SR500 and SR400’s were in attendance also. They’re even more popular in Japan as the XS 650, one reason is the much lower insurance-premium on these bikes. Ok, enough words, some pics, enjoy! OK, I´m handsome, but mr. Holland……???? Hans, Where can one pick up a frame like one used on the white cycle? Traverseable, that’s not a frame you “pick up”… You make it. It’s uncanny to see some of these rides now that “Brat” has caught on my mind as cool new discipline for building custom bikes. I’m flexing these design cues into my XS build , which will be done in 30 days. I’m adding a twist to it however….it’s a low slung two-door brat chopper with a sissy bar and 2.5″ of travel in the rear. (seat for two) I’m going to keep all the amenities like horn, turn signals and battery, all while cleaning up the frame and concealing all the accessories including the coil under the seat. Maybe I’ll post it here with Hans’ permission. That must’ve been a heck of a show. any info on the white bike without a tank and the other one with a springer front-end?i think they are awesome. Love the red XS Hans built looking into the same style for my brat.